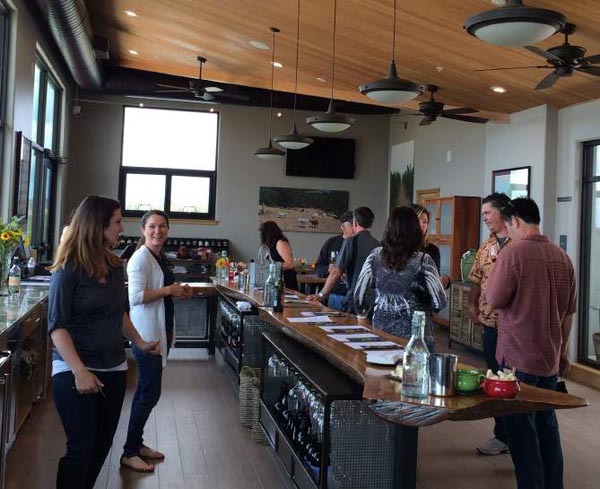 A view of the tasting room. –Pacifica Wine Division, a branch of the full-service commercial, industrial, and investment real estate companyPacifica Commercial Realty, in conjunction with Sotheby’s International Realty, has announced today that Burbank Ranch winery and estate located in Templeton is now officially listed for sale. Burbank Ranch is located in the El Pomar District of the Paso Robles American Viticulture Area or AVA, which is widely recognized as one of the best grape-growing regions in the world. 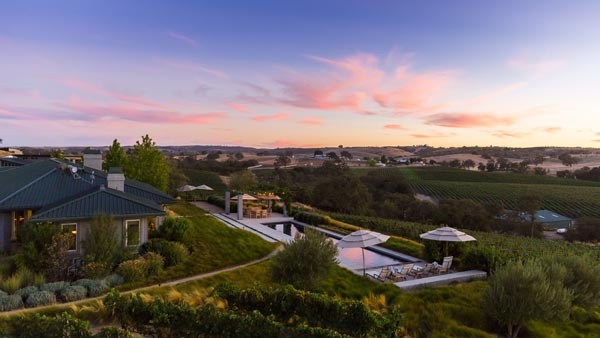 The property has 83.5 oak-tree studded acres, a main house complete with swimming pool, a newly completed, state-of-the-art winery and tasting room with offices, a barn with an attached apartment, a gate house, and many more amenities added by the winery’s current owners, Fred and Melody Burbank. The property has panoramic views of the Salinas Valley, the Santa Lucia Mountains, and oak-lined seasonal creeks. Located near the “Templeton Gap” in the Santa Lucia Mountains, cool Pacific Ocean air flows nightly into the ranch. Thomas J. 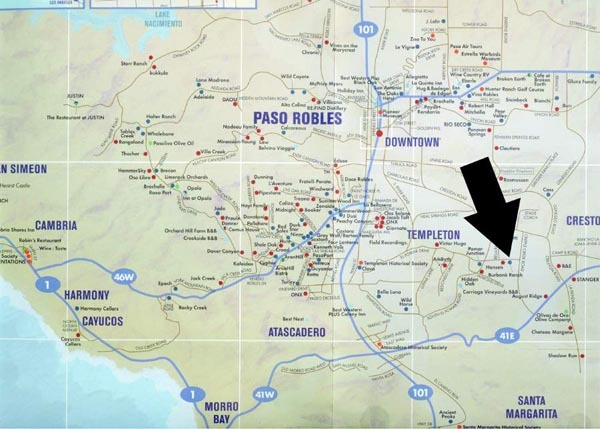 Rice, professor of soil science at California Polytechnic State University in San Luis Obispo, has shown that the geologic formations in Paso Robles are similar to those in the Tuscany region of Italy and the Rhone, Bordeaux, and Burgundy regions in France. The main house and swimming pool. Over 44 acres of 16 different diverse varietals have been planted complete with underground irrigation plumbing systems. There is a 200+gallon/hour well on the property, and all systems irrigate with the “drip” method to conserve water. The entire property was fenced in 2008 with 8’ deer-proof fencing. Owl houses encourage natural pest reduction, and bird netting is let down to protect grapes from birds in summer months. The vineyard was developed and planted in 2008 using sustainable farming practices. In 2013, following a yearlong examination of farming practices; the ranch was awarded the Sustainability In Practice (SIP) certificate. 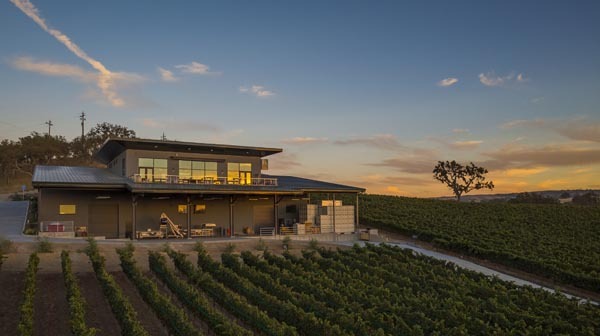 The 19,000 square foot winery/tasting room structure includes a massive oak bar, views of the surrounding mountains out of the wall-to-wall windows, an on-site kitchen, a crush pad, fermentation tank room, and an underground wine cave system. The main house is located at 5685 El Pomar Dr. in Templeton, and is a one story, four bedroom, 4.5 bath, 4550 square foot frame house built in 1996. The exterior stucco was re-done in 2009, and a grand oak bar was added in 2012. In the backyard of the main house, there is a swimming pool, bocce ball court and multiple redwood garden beds. When the pool cover is closed, the pool is safe for an adult to walk across it, making the back yard safe for children who are not yet able to swim. In 2008 the 2970 square foot “Green Barn” steel agriculture building was constructed. The barn primarily houses the machinery needed to farm the ranch. A 650 square foot, 2-bedroom apartment exists within the northeast corner of the barn. It has electric power and water, is fully air-conditioned, and has a complete kitchen, living room, and bathroom that contains a washer and dryer. An additional, 1000-square foot, fully air-conditioned, landscaped, three-bedroom, two-bath, gatehouse was constructed in 2009. The main house, green barn, gatehouse, and tasting room/ winery have high-speed internet-access and security cameras. All structures share the same architectural theme of gray stucco walls with green aluminum roofing. The current location of El Pomar Drive, the street the ranch is on, is in exactly the same place today as it was in 1887. The ranch has been registered under the Williamson Act as a farming preserve. As such, the tax rate for the ranch is lower than for property not so registered. Burbank Ranch is fully licensed to operate as a winery, sell wine, host events, operate the commercial kitchen located on-site, and is additionally registered as a bed and breakfast facility.